I love these candles. They burn perfectly every time, and really do last for 15 hours. I burn them most of the time when I’m home, which is most of the time. I used to burn scented, non-beeswax votives, and I couldn’t figure out why my house never smelled good. Once all the artifical scents were gone, I could see that those candles were the problem, not the solution. I only use beeswax candles now, and these are the best I’ve found. Just like the ones I used to be able to get at a local store, meaning, really truly 100% beeswax – no chemicals! Good quality, and arrive sooner than I expected. I use candles for my home altar. I constantly have to fuss with them to keep them burning. That is all a thing of the past. The Beeswax votive candles from your company have changed my life. No more fuss. These candles burn great on their own until the last particle of wax is consumed. I bought this as a holiday gift and mailed it directly to my niece. She loved them and said they smelled so good. I grew up with beeswax candles so I guessed they’d be the hit they were. Love these candles. The fragrance is lovely, they burn evenly, and I like that there are no additives. wonderful product at a reasonable price! Love the solid feel of these, and the burn time only adds to the quality. I have ordered these candles several times. These are my favorite bees wax candles. fast shipping! Love em!!! Thanks for the great product. These candles are great. No burning smell so you can breath easy around these candles. Love them, will be buying more as needed. Thank You! Excellent quality product. They burn cleanly & put off no smoke or noxious fumes. They have a substantial wick supporting a good flame. They have a pleasant, easy to use site & shipping is quick. Bought these a few weeks ago, and they’ve been great! They smell great, burn great, look great. I have only good things to say. The customer service was also spectacular. I entered my address incorrectly, notified them via email, and they responded quickly fixing the problem. The shipping was also quick. Overall, I had a great experience and would definitely buy these again. Glad I found your site I can’t believe whats in candle wax now I know were breathing a candle thats safe. All the candles we have bought from Bee Hive Candles over the years, whether they be votives, pillars or others are absolutely outstanding. They are extremely well made, smell wonderful without being overpowering, burn very well and are pleasing to all senses (except taste since we haven’t tried to eat them yet). 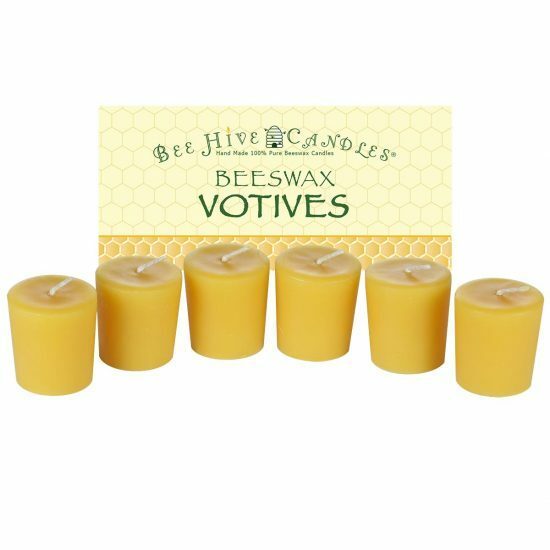 The pure beeswax votives are beautifully made; burn cleanly; and have a light, wonderful scent. I’m very pleased and highly recommend them! I got these votives for use in my glassy babies, handblown glass vessels. The candles are solid and last 10 or more hours and burn all the way down. A little water under the base that has a metal disk and they come out easily too. Glad I found Beehive Candles back in 2016. I’ve tried other beeswax candles and they do not burn until the bottom. Beehive has a quality product. Best I’ve found! These Are The BEST Candles!! I have tried so many beeswax candles over the years that I was about to give up. They either didn’t burn all the way, the wicks would drown or they wouldn’t burn at all due to poor wick choice. So I’m thrilled to have discovered Bee Hive Candles because these are by far the best smelling and the best burning candles. Ever! 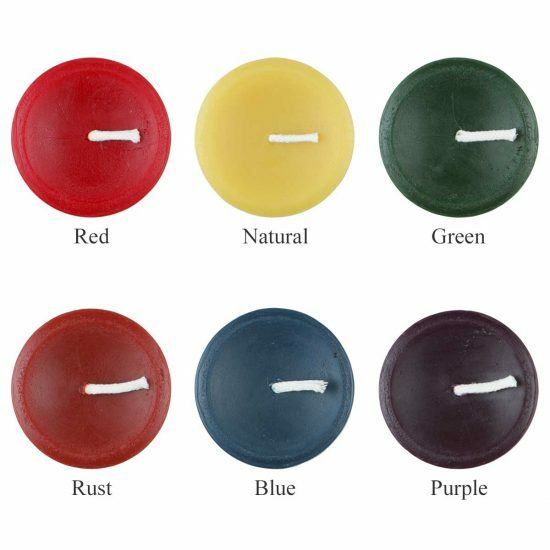 Even burning candles, can mix/match colors in one order. I feel good about burning beeswax rather than soy or paraffin. I like that these are unscented. I will buy again. Wonderful smell! They burn a long time and also they burn more cleanly than other beeswax candles I have tried. Very happy so far. Just what I was looking for, nice simple beeswax votives. Just the thing. Simple clean all natural votives at a good price. My main issue with buying candles are finding healthy candles and these are it. I love how you don’t have to worry about any chemicals or anything in these candles. They smell great and they’re beautiful. I really do recommend then! These are the best votives ever! These are special candles — they can easily burn for 8 hours at a time. I love the glow and the fact that they do not put toxic elements into the air. I frequently give them as gifts to friends, family and colleagues, along with a votive holder. I’ve purchased many votive candles, but have never found other candles that are of the quality of these candles. They have a lovely aroma, when burning suspended the wick frequently falls through but makes for an interestingly beautiful display. Read somewhere that these type of candles are good for allergies. I’ve been burning the candles nightly for over a week and I notice a significant difference. Helps me breathe better. And I just put in another order. These pure beeswax candles are so pure and natural. They last a very long time and do a wonderful job of freshening the air. I use them after cooking fish or brussel sprouts. I’ve used these candles for years! They are non-toxic which is the main reason for me to buy them. They burn cleanly, slowly and do not leave a noxious odor behind. The six package are perfect for gift giving! I only buy bees wax candles from you. They are the best I’ve ever found. They’re glowing, scent delicious and long burning. Super happy with how long these have lasted. And they smell good without being overpowering. These candles never disappoint. They are the best! I love the votive candles. I burn them at least two hours every night in our bedrooms as part of an allergy prevention strategy. They are a beautiful and practical. So classy and attractive; make the air smell good even when not lit; good price; attractive packaging. Worth it. I do love this product, the honey scent is not as strong as some others I have bought directly from farmers market. But I will say they last longer than any other beeswax candles I have bought so the quality is great. I like the price too, which is why I will continue to buy from this company. Buying in bulk through this company helps a lot with saving in the long run. Thank you! I’ve been buying these votives for years from Beehive Candles, and I’ve never been disappointed. I use them almost everyday. They make the room smell fresh and clean, without any chemicals, and there is none of the black soot on the ceiling that I used to get from other candles. They burn very evenly and don’t drip. These are my favorite candles for many years now. These candles are wonderful they make the entire room smell like honey. Love the beeswax candles for their air cleaning properties and purity. I wish they burned more evenly. I do have them in a votive candle holder which I spray before inserting the candle. Thanks for your input! This is normal, and why a votive must be burned in a votive holder. Votives are wider on the top and aren’t able to hold their own wax pool. During the initial burn they melt down to take the shape of their container. Votives are my all purpose, go to candle and I go to these most often. I especially love them for my prayer altars. Your products are the best and I have finally found my go to store for all of my candle needs. I burn them every evening they fill the room with a warm light and wonderful mild honey scent. Gorgeous, glowing candles. Beeswax is so beautiful! Have used these for years. Great candles and no one has a problem with them burning. I am enjoying your beeswax candles very much. Not ony are they pretty, but they are non-toxic and that gives me peace of mind. Love the way your candles purify the air and burn clean. Glad to have non-toxic candles. I told you I’d be getting my candles exclusively from you! They really are the best…dense, glowing and oh, that aroma! They are a very satisfying joy in my life. I also love the positive ion output from the candles, nice clean air, thank you! The votive I’ve used seems to be helping with my allergies when I burn it for an hour before bedtime with the door to my room shut. It did burn unevenly through the side the first time I used it. It was level and in a in a holder. ? Not having great ventilation in a house where we enjoy a home-cooked meal just about every night, I wanted a candle that would help eliminate cooking odors without leaving behind a perfume-y smell. I found exactly that in these candles! They are affordable considering the natural resources used and the amount of time taken to create each candle. They burn beautifully and emit a sweet, honey scent that eliminates, NOT MASKS, the cooking odors. They burn for quite a long time and I feel good about supporting a company that is as environmentally responsible as Bee Hive Candles. We used your votive candles at a significant birthday celebration to enumerate the number of years that our four-generation patriarch has graced the earth. The ambiance of the pure candle light (not to mention the natural fragrance) was key to effectively conveying the heartfelt sentiments of that gathering. Thank you again. Beautiful natural golden color with a light honey scent. Love it! I’m grateful to have a natural non toxic candle option for my home. Same as tea lights…simply wonderful! I just found you guys on the internet and decided to give you a try. I am so glad I did. Your descriptions, dedication to purity and customer service are very impressive. Thank you! These give off beautiful radiant light and seem to last long even when there’s just a half-inch of wax left. I use these all over the house. I use these scattered around the room when I do my yoga practice. Beautiful light, long lasting. Just right! Wonderful long burning votives.love that they are all natural.